For every gallon of ink that has been spilt on the trans-Atlantic slave trade and its consequences, only one very small drop has been spent on the study of the forced migration of black Africans into the Mediterranean world of Islam. From the ninth to the early twentieth century, probably as many black Africans were forcibly taken across the Sahara, up the Nile valley, and across the Red Sea as were transported across the Atlantic in a much shorter period. Yet their story has not yet been told. This book provides an introduction to this “other” slave trade, and to the Islamic cultural context within which it took place, as well as the effect this context had on those who were its victims. 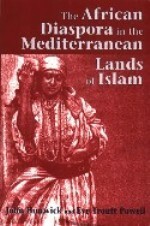 After an introductory essay, there are sections titled ‘Basic Texts (Qur’an and Hadith)'; ‘Some Muslim Views on Slavery'; ‘Slavery and the Law'; ‘Perceptions of Africans in Some Arabic and Turkish Writings'; ‘Slave Capture'; ‘The Middle Passage'; ‘Slave Markets'; ‘Eunuchs and Concubines'; ‘Domestic Service'; ‘Military Service'; ‘Religion and Community'; ‘Freedom and Post-Slavery'; and ‘The Abolition of Slavery.’ A concluding segment provides a first-person account of the capture, transportation, and service in a Saharan oasis by a West African male, as related to a French official in the 1930s. John Hunwick (Northwestern University) is the author of Timbuktu and the Songhay Empire, Religion and National Integration in Africa, and several other books on Islamic Africa, including Jews of a Saharan Oasis: The Elimination of the Tamantit Community (also available from Markus Wiener). Eve Troutt Powell (University of Pennsylvania) is a historian of the Middle East and author of A Different Shade of Colonialism.